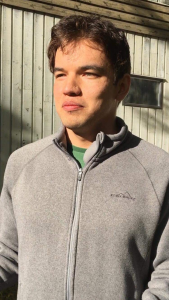 Stephen Jolly is currently a 3rd year NITEP student from a Cree First Nation in Northern Québec and Ontario. Before coming to UBC Stephen studied at Algonquin College in Ottawa, Ontario. He was attracted to seeing and experiencing the different parts of Canada and decided to come to Vancouver wanting to experience Western Canada. Looking back on his high school experience Stephen really appreciated and respected his high school teachers for the support and encouragement they gave him in his learning, and for believing in him to go to university. This helped inspire Stephen to want to be involved in education and provide the same sort of care for future students. Stephen says that discussions with his father, a director of education in his home community, was another strong personal influence in wanting to be involved in education. Upon coming to UBC, he began in the Arts program, wanting to focus his studies in psychology while thinking about becoming a guidance councillor. After attending a presentation from NITEP Stephen became interested in the program and the classes it offered. After taking time to research the program more fully and think about how it aligned with his interest in education he decided to transfer into NITEP. Stephen notes that moving from his home community to Ottawa was a challenging transition, but one which he believes better helped him in moving to UBC Vancouver. When asked about settling into life in Vancouver, Stephen appreciated the community atmosphere which NITEP offers. Stephen is also appreciative of the various experiential learning opportunities that NITEP and its staff have offered him. Through his studies he has shown a dedication to promoting Indigenous education through his participation in a variety of extracurricular work. This includes assisting with the 2017 K-12 Aboriginal Math and Literacy Symposiums and being a student researcher with the National Centre for Collaboration in Indigenous Education – a project which aims to document Indigenous educational programs across Canada and create a space for resource sharing. As he continues his studies Stephen is interested in discussions surrounding the restructuring of education in communities, including how such visions can be supported. He foresees himself working in Indigenous education settings, supporting students at the secondary level.